Arab Republic of Egypt, is a country mainly in North Africa, with the Sinai Peninsula forming a land bridge in Southwest Asia. Egypt is thus a transcontinental country, and a major power in Africa, the Mediterranean region and the Islamic world. Covering an area of about 1,010,000 square kilometers (390,000 sq mi), Egypt is bordered by the Mediterranean Sea to the north, the Gaza Strip and Israel to the northeast, the Red Sea to the east, Sudan to the south and Libya to the west. 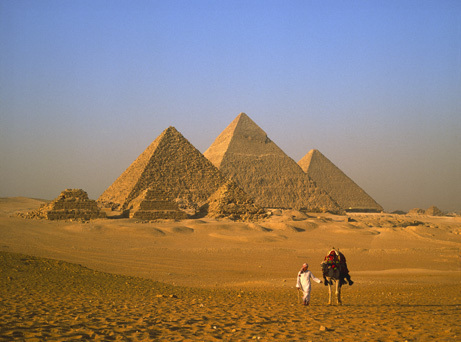 Egypt is one of the most populous countries in Africa and the Middle East. The great majority of its estimated 90 million people live near the banks of the Nile River, in an area of about 40,000 square kilometers (15,000 sq mi), where the only arable land is found. The large areas of the Sahara Desert are sparsely inhabited. About half of Egypt's residents live in urban areas, with most spread across the densely populated centres of greater Cairo, Alexandria and other major cities in the Nile Delta. Egypt is famous for its ancient civilization and some of the world's most famous monuments, including the Giza pyramid complex and its Great Sphinx. I love Egypt, it’s really a wonderful country, it is my home. If love was measured in miles then my heart could cover oceans. If love was measured in years then my heart is a grandpa. If love was measured in watts then my heart can light the city. If love was measured in dollars then my heart can own the world. If love was measured in grades then my heart has got an A.